It’s been a while since my last posting and I know some of you were looking forward to my latest creations but I do this as a hobby and I want to apologize in advance if I keep disappearing like this for months at a time. Baking is also something that I’m not really crazy about because it requires a sort of discipline and creativity that I am not usually known for. 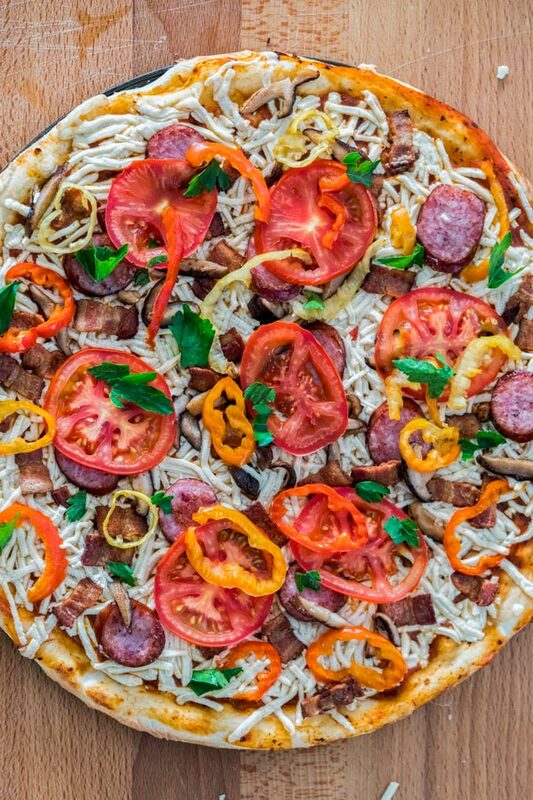 Now I like pizzas very much and while most of my recipes seem to have a similar idea and ingredients, I assure you the taste and flavors are all too different. Sometimes minor changes on a recipe will turn your dish from great into something amazing. Well, not always but that’s the secret of baking. Anyway, take this recipe, while it looks somewhat similar with my Sausage pizza, there are some big changes there, loads of hot peppers for one and lactose free mozzarella which I used for the first time on a pizza. Definitely, lactose free cheese is something that requires a little bit of getting used to, but it really worked for me and the only thing that I had a bit of trouble with was the fact that it doesn’t melt as fast as the normal cheese does. We ate the whole thing in one sitting though and I hope you guys enjoy it too. Fry the bacon and the sausage the way you like them. 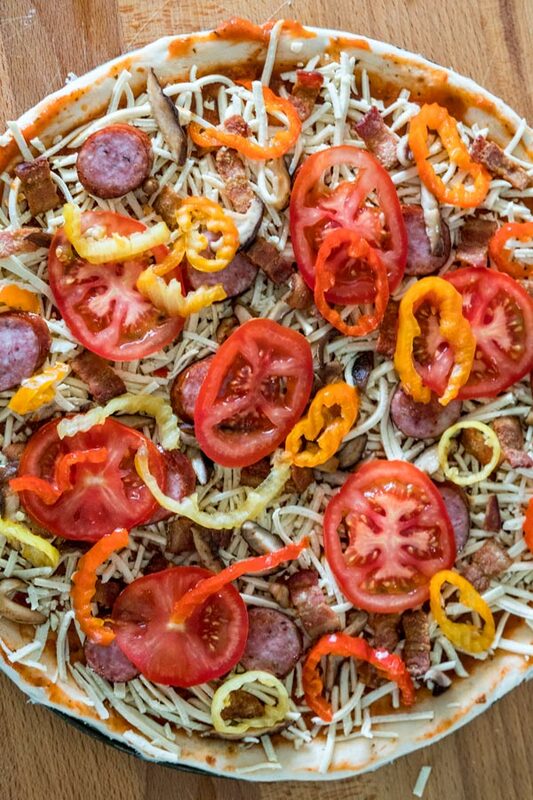 Add in this order: shredded mozzarella cheese, sausage slices, bacon, mushrooms and tomatoes. Top with hot banana peppers. Bake for 10-15 minutes, make sure it doesn't turn into a biscuit. Sprinkle some chopped basil/parsley and enjoy.